This is the text of a speech given today (2 February 2017) by Ellen Hazelkorn at the Undergraduate Awards “Island of Ireland” Event, held at Dublin City University. The last few years have been tumultuous. The recent Brexit vote, the US Presidential election, as well as votes in Italy and Austria – and forthcoming elections in NL, France and Germany – highlight a growing gap between people with a college education and those without. We have seen the emergence of the notion of “post-truth” – with fake news, “alternative facts”, and so on – through which debate is framed largely by appeals to emotion, and repeated assertion. Facts are ignored and denied. Truth is what some-one wants it to be. The White House webpage on climate change (a euphemism for global warming) disappeared immediately after Trump’s inauguration. [i] There are clear echoes of Orwell’s Nineteen Eight-Four, which has once again become a best seller. And, restrictions and fears about immigration to the UK and across Europe, as well as a travel ban in the US, have affected students and scholars, but also graduates, professionals and workers of all levels and creeds. Higher education is global – in fact it is one of the most internationalised part of our societies and economies. Colleges send their students and staff abroad, and welcome students and staff from around the world. Research is international, and universities work with partners around the world to generate new ideas and theories, to create new programmes and degrees, and even new institutions. More than half of all colleges include internationalization among their top strategic priorities. But, recent developments put higher education at odds with emerging nationalist and nativist thinking and policies. Colleges that have prided themselves on working across borders of country and culture now find themselves dealing with governments which have campaigned to keep out foreigners. Current developments threaten the fundamental values of higher education – multiculturalism, international collaboration, free flow of people and ideas, broadly liberal social values. But, most of all, they threaten the academy’s paramount value of the pursuit of truth. Because these values are perceived to be in danger, universities are responding. A response is also coming from business. The Irish CEO of a Silicon Valley start-up, Intercom’s Eoghan McCabe – a TCD graduate – made a statement “supporting our Muslim brothers and sisters in tech”, He has invited immigrants working in technology to move from the US to Dublin’s start-up scene, and proposes to support them in various ways throughout this process, including up to €5k for legal bills. They are also matching staff donations to the ACLU up to the level of $50k, along with Irish-born CEOs of Stripe, and other Silicon Valley companies. Academic and research collaboration is not a new phenomenon – but it is now more visible. More than 4.5m students are enrolled in tertiary education outside their country of citizenship. [v] The OECD projects that the world’s population of international students will reach 8m by 2025. [vi] At the same time, governments everywhere are investing heavily in the expansion of their higher education systems. They are creating scholarships to help their students acquire education abroad – and then bring their talents back home. They are also supporting cross-border partnerships and exchanges that can elevate their countries’ status, potential for innovation, and influence in the world. Globalization also produces big societal challenges with impacts flowing across boundaries – which we were previously able to ignore. Recent politico-religious movements (e.g. jihadi extremism), health (e.g. Ebola, Zika) and migration (e.g. Mediterranean migration) illustrate the extent to which local/regional issues have quickly acquired global implications – and global political consequences. Conversely, climate change shows how global issues carry significant local effects, e.g. global warming with its knock-on effects for food, health, water, security, and of course the eco-system. The Human Genome Project is a good example. Here, researchers in computer science and statistics worked alongside those in genetics to identify and map all the genes, with aim of identifying the roots of disease and then developing treatments. This has been the world’s largest collaborative biological project and involved research groups from Europe, Asia and the US – which could not have been undertaken within one lab, or even one country. Because such challenges are complex, they necessitate strong collaboration, and a well-informed, internationalised citizenry. Universities work across borders, languages, and cultures more than ever. But even within higher education institutions, there is a necessity to overcome one of the greatest barriers of all: namely that between academic disciplines and departments. But – the challenges go deeper. Recent events suggest that higher education institutions which collaborate with peers internationally may be leaving their hinterlands behind. Events highlight a widening gap between universities and their publics and regions, in which they are located – what Robert Putnam calls “civic disengagement”. In many countries, there is a loss of trust in our public institutions. The public is also asking whether higher education is serving its interests. Those interests inevitably vary depending upon who is asked – students, parents, employers, politicians, etc. While there is a consistent view that a college education is important and highly valued, surveys show concerns about the cost and relevance of higher education on the part of many people who are unaware of the sector’s diverse functions and contributions to society. Instead there is a war-of-words about graduate attributes and career readiness. These tensions highlight an underlying problem. The social justice model focuses on students, curriculum and pedagogy. At the other end of the spectrum is the economic development model, which focuses on the commercialization of research through intellectual property deals, technology transfer, etc. In these two models, civic engagement is assigned to a parallel or “third stream”. In contrast, the public good model sees engagement wholly embedded within and across all functions and units of the college/university – acting as a bridge across teaching and research. Not just for the students or for commercialized research – but for the entire institution (students, academic staff, researchers, administrators) – in partnership with its many publics. The Irish Universities Act unambiguously sets out the role of the university “to promote learning in [the] student body and in society generally”, “to promote the cultural and social life of society”, and “to disseminate the outcomes of its research in the general community”. [viii] Civic engagement is a duty – reinforced in the National Strategy for Higher Education to 2030. The agenda is bigger than simply pushing out knowledge – grandstanding about what the university does for society. There are no simple answers – but there is a necessity for higher education institutions to use all its resources – human and capital – to re-articulate its commitment to the public good, and to reach beyond its campus and work with its many publics. In other words, its not just about what happens on campus – but bringing it back home and making it meaningful for society more broadly. Failure to treat this agenda seriously is likely to see an ever-widening gap between higher education and its publics. There is no time for complacency. This entry was posted in Higher Education and tagged higher education, Ireland on February 2, 2017 by Andrew Gibson. 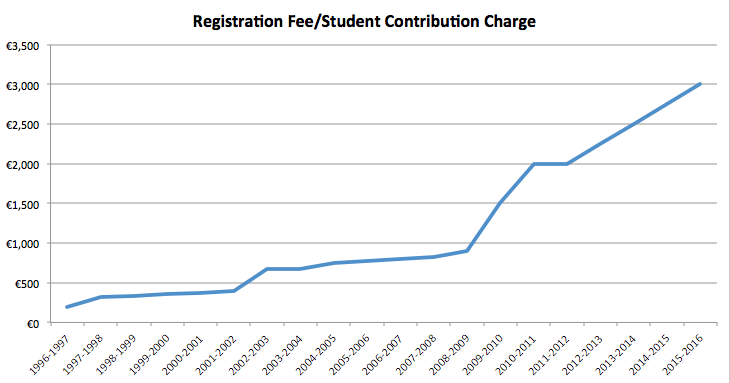 This is just a quick graph I put together for a report, showing the increase in what has variously been known as the student contribution charge, or registration fee, since the introduction of “free” public higher education in Ireland. Data comes from a mixture of Eurostat, Department of Education and Skills, and Higher Education Authority sources (these will be linked to in due course). The fee of €3000 is expected for 2015-2016. Pre-2002 values directly converted from punts into euro, and all values are current/nominal prices. 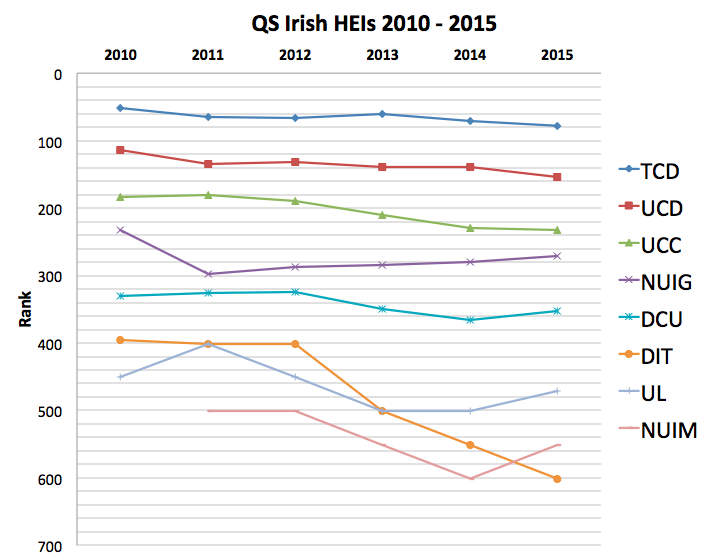 This entry was posted in Higher Education and tagged higher education, Ireland, student fees on January 14, 2015 by Andrew Gibson.